Kathy and I traveled to Louisiana near the end of June to spend time with our families (we’re both originally from the Bayou State). We enjoyed seeing family and cooking good food while there (we carried cast iron with us!). And then our last task before driving back to Kentucky is to go to one of the local grocery stores and buy as many regional groceries as we can fit into our ice chest. 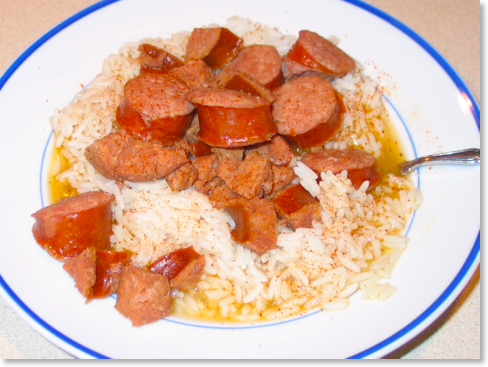 One of the items I buy when in Louisiana is real andouille sausage. I’ll use it in my recipes until I run out. Then I have to use that Yankee brand (Johnsonville) until we can make another run south. Coming back stocked up on good sausage made me sort through my old copies of Louisiana Cookin’ Magazine for the recipe that is in this post. This particular recipe is adapted from a 19th century dish. I’m pretty sure I have the older one and have made it before, but for the moment, I cannot put my finger on it. I’ve made this recipe or some form of it about three times now. Slow-cooking the sausage in a dutch oven results in very tender meat that falls apart in your mouth. Kathy is not normally much for sausage as a main ingredient; it’s fine for her in something like red beans and rice. But this is a recipe that she really enjoys, as do I. 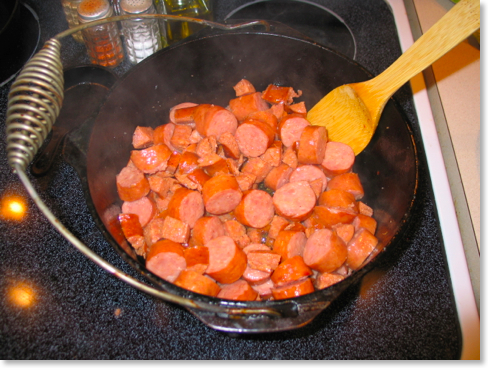 Often with recipes that use andouille or smoked sausage, a skillet is used in combination with the main pot. One convenient aspect of this recipe is that everything can be prepared in one pot. For this recipe, I used Savoie’s andouille and Down Home medium smoked sausage (if you know of a link for the latter, contact me). The original recipe said that this made four servings. Okay, I know some people are prone to overeating, but a person would have to have really large bowls to spread this out over only four servings. 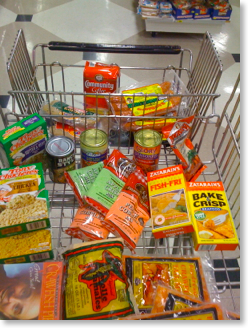 Eight or more servings is more realistic--even for hearty eaters. 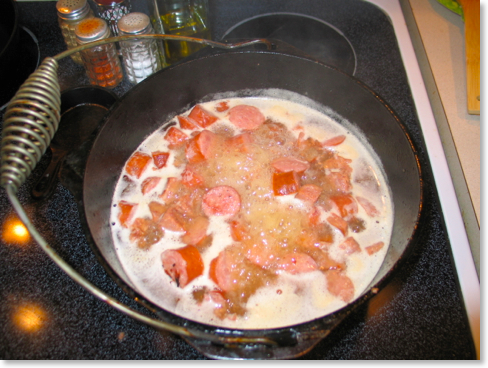 Boil the andouille in 3 cups of the water until tender, about 30 minutes. 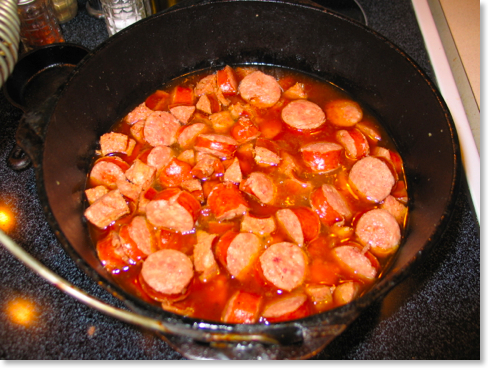 Drain, discard the water and set the andouille aside to cool. Cut the Cajun smoked pork sausage into bite-sized pieces. 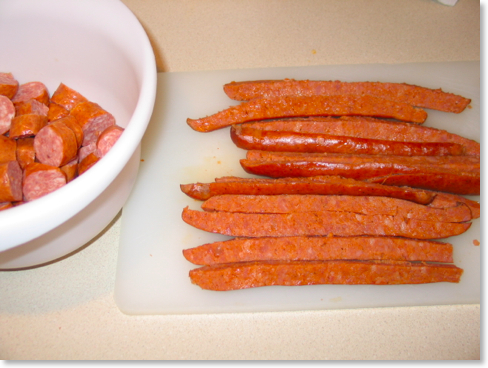 Quarter the andouille lengthwise and cut into bite-sized pieces. Heat the oil in a cast iron pot over a medium high heat. Add the sausage and andouille and sauté until well-browned, about 5 to 7 minutes. Add one cup of water to deglaze the bottom of the pot, scraping it with a wooden spoon. Add the remaining water and bring to a boil. Cover, reduce the heat to low, and simmer, stirring occasionally, for 2 1/2 hours. After two hours, taste and adjust with salt, black pepper and cayenne, if necessary (it wasn’t necessary this time due to the spice already in the sausages). As I mentioned, I’ve made different variations of this recipe before. One of these other methods required slow cooking the dish in the oven instead of on the stovetop. I’ve had results with thicker gravy, although there’s nothing to complain about the outcome shown above. The gravy in this case was more like a broth, but a very rich one made from the juices of the sausages mixed with the water. Adding less water would result in a thicker gravy if desired. This recipe originally appeared in the February, 2002, issue of Louisiana Cookin’ Magazine.